The Objective Dialogues Y-Table consisted of a three way, Y-shaped table with 4 analytical examination stations, a display system, examination sheets, audio recorders and a facilitator. The examination stations refer to classical scientific methods in order to question the contemporary alliances between scientific research and the arts. This is equally indicated by the title of the project: Objective Dialogues are not objective but about objects.The table was equipped with a 3D scanner and three analysis stations offering digital scales, measuring devices and an illuminated magnifying glass, and stood directly adjacent to a display cabinet from which objects could be observed and selected for investigation. Pairs of investigators would be guided through the process by a facilitator who would begin by creating a 3D scan of the object. 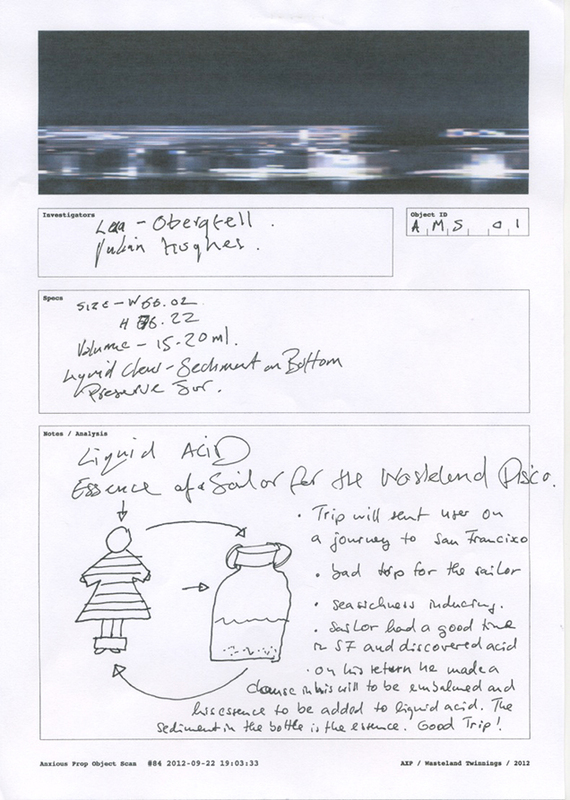 This scan would then emerge as a printed colour image from beneath the table in the form of an A4 frame divided into object image and fields of information: names of the investigators, object specifications and analysis notes along with fields for the cataloguing of the object. The aim of The Objective Dialogues Y-Table was to initiate and mediate dialogues between the participants of the forum by way of material objects collected and submitted by artists and researchers from the network. Pairs of participants selected an object, examined it with the help of the different stations, and documented their results. Thus the idea was to induce and facilitate debate by way of an anti-curatorial installation to collectively investigate material objects from WTN sites. 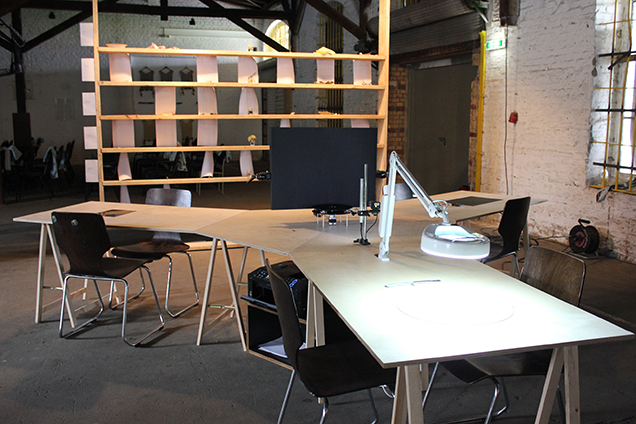 The OD Y-Table has been built around two shared interests: the collective nature of creative insight processes and the role of the materiality of knowledge therein. If we take the stance that both artistic and scientific processes are concerned with the recognition of new things or at least of new aspects about known things, how then might this process be studied and discussed? Might it be possible to explore the shared insight processes at work here in terms of art? Through aiming to encourage abductive hypotheses within our artistic intervention the creative generation of hypotheses and operative diagrams are put centre stage. The OD Y-Table aimed to be an artistic implementation of this principle by facilitating the abductive construction of narratives. It aims at something that has its own peculiar existence: dialogues between pairs of participants about and driven by objects extracted from the target sites. With participants as the community of inquiry, the OD Y-Table takes Ludwig Wittgenstein’s principle that insight is not private (See his Private Language Argument in Philosophical Investigations, §243 ff.) as a starting point. Therefore, it aims at collective narration-building: it provides examination stations to collectively construct hypotheses in the exploration and comparison of different sites. Thus the project aims to dismantle the relationship between expert and non-expert, object and subject, artist and audience, and the related dichotomies that have dominated large parts of western thinking in the modern age. The second principle that the OD Y-Table draws on is the materiality of knowledge: that which cannot in some way be made visible must first be originally present during a process of collective insight. This is what the OD Y-Table focuses on: objects extracted from different wastelands central to the content and discourse of the forum are used in an attempt to integrate specific characteristics tied to these spaces into the collective insight processes of the WTN Forum. 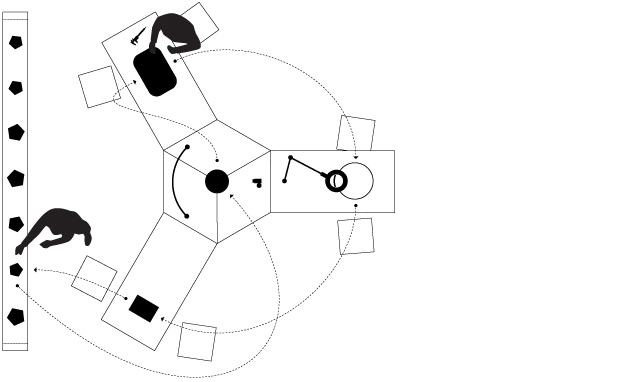 As a counterpoint to the fetish of interconnected online networks, material objects provide a balance to the digital dematerialisation of collective working processes. In the OD Y-Table, objects are framed as material touchstones for an engagement with the artistic and research agenda of the WTN Forum. With Alex Head and Miodrag Kuč and project Contributors Will Foster, Patrick Kochlick, Jens Wunderling, and Luis Berrios-Negron. For the Wastlend Twinnings Network Forum 2012 at ZK/U Zentrum für Kuns und Urbanismus, Berlin Moabit.